Definition at line 35 of file llgl.cpp. Definition at line 927 of file llgl.cpp. References gGLManager, glGetError, gNoRender, llendl, llerrs, and LLGLManager::mInited. Definition at line 948 of file llgl.cpp. Definition at line 1324 of file llgl.cpp. Definition at line 1342 of file llgl.cpp. Definition at line 1307 of file llgl.cpp. Referenced by LLDrawPoolAvatar::endSkinned(), and LLDrawPoolAvatar::renderForSelect(). Definition at line 1314 of file llgl.cpp. Definition at line 1335 of file llgl.cpp. Definition at line 1300 of file llgl.cpp. Referenced by LLDrawPoolAvatar::beginSkinned(), and LLDrawPoolAvatar::renderForSelect(). Definition at line 922 of file llgl.cpp. Definition at line 1383 of file llgl.cpp. References LLStringBase< char >::convertToS32(), i, S32, and start. Definition at line 915 of file llgl.cpp. 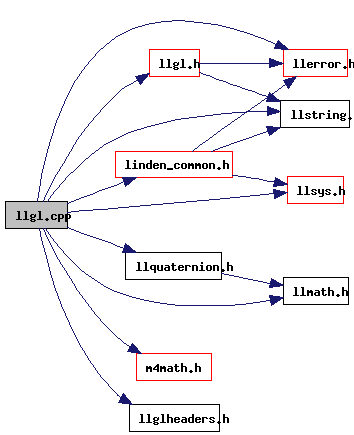 References LLQuaternion::getAngleAxis(), glRotatef, RAD_TO_DEG, x, y, and z. Definition at line 1365 of file llgl.cpp. References FALSE, glVertexAttribPointerARB, and stop_glerror. Definition at line 1374 of file llgl.cpp. References gGLManager, glColorTableEXT, and LLGLManager::mHasPalettedTextures. Definition at line 1357 of file llgl.cpp. References glVertexAttribPointerARB, stop_glerror, and TRUE. Definition at line 1349 of file llgl.cpp. Definition at line 75 of file llgl.cpp. Definition at line 269 of file llgl.cpp. Referenced by assert_glerror(), LLCubeMap::bind(), LLImageGL::bindTextureInternal(), LLPipeline::canUseVertexShaders(), LLImageGL::cleanup(), LLImageGL::createGLTexture(), LLImageGL::destroyGL(), LLImageGL::destroyGLTexture(), LLCubeMap::disable(), display(), LLCubeMap::enable(), LLFloaterReporter::gatherReport(), LLParticlePartition::getGeometry(), LLViewerImageList::getMaxVideoRamSetting(), gl_line_2d(), gl_rect_2d(), LLUseOcclusionListener::handleEvent(), LLViewerParcelOverlay::idleUpdate(), LLCubeMap::init(), init_debug_rendering_menu(), LLVOSky::initCubeMap(), LLCubeMap::initGL(), LLFeatureManager::initGraphicsFeatureMasks(), llDrawRangeElements(), LLViewerWindow::LLViewerWindow(), LLFeatureManager::loadGPUClass(), main(), LLDrawPoolWater::prerender(), LLFace::pushVertices(), LLPanelDisplay3::refreshEnabledState(), LLPanelDisplay2::refreshEnabledState(), LLVolumeGeometryManager::registerFace(), LLTexLayerParamAlpha::render(), LLDrawPoolWater::render(), LLDrawPoolTerrain::render(), LLPipeline::renderGeom(), LLDrawPoolWater::renderShaderSimple(), LLVOSky::restoreGL(), LLViewerWindow::restoreGL(), send_stats(), set_palette(), LLImageGL::setMipFilterNearest(), LLShaderMgr::setShaders(), LLViewerWindow::stopGL(), LLDynamicTexture::updateAllInstances(), LLViewerImageList::updateImagesCreateTextures(), LLViewerImageList::updateImagesMediaStreams(), LLVOSky::updateSky(), and LLVOAvatar::updateTextures(). Definition at line 76 of file llgl.cpp.